The Fourth » This is the last straw. She’s just really enthusiastic, is all! She needs to vent. Soon. Her expression in the last panel…I think she’s gonna crack, soon. Also, I feel the need to overdramatically stab my straw into the next drink I have. Ecta’s on the verge, boys. Hehe, the new avatar works really well! Ecta’s facial expressions make my dreams come true. Also, if bartender Adorable Lady over there doesn’t have a name, I’m dubbing her Stella. He’s just happy because Ecta is smiling! … XD I have no words. Slice doesn’t care about the splash due to being a fish, and Davis IS worried due to his fire-tossing. Very clever little nod. She’s slowly starting to lose her mind. I think she’ll have a mental breakdown soon. Aww, thanks! Some rope was what, I wonder? 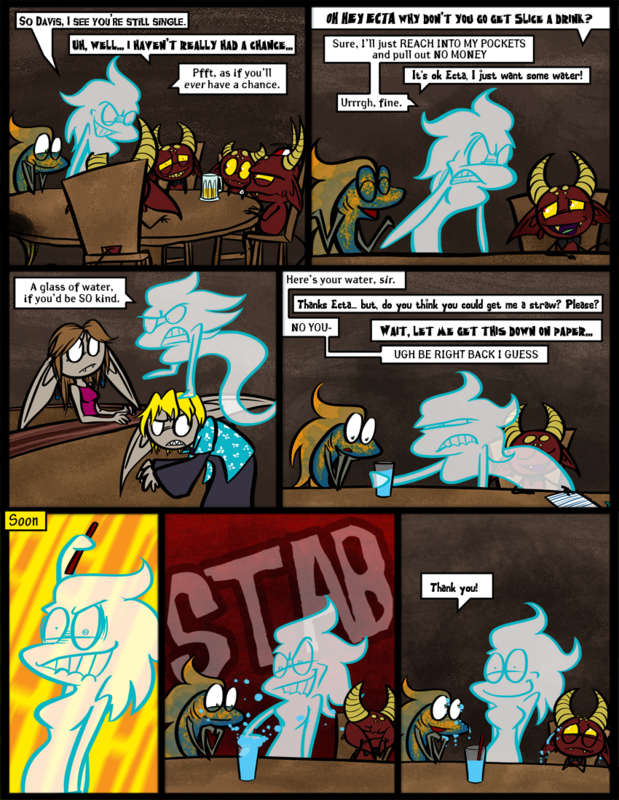 STAB: The BEST sound effect! The emotional states on the last panel was amazing! Not only is Ecta’s emotion – the complete opposite of her normal attitude – was a sign of her mental breakdown, but the reactions of the other two characters would possibly reflect their mood toward Ecta (including Slice receiving the compliment of being “blue”), but also their characteristics – Slice liking water, and Davis’s liking of fire (which is easily washed by water)! Absolutely amazing! Hello! Thank you, I’m quite flattered that you think it’s “absolutely amazing,” hehe. I am glad people notice the little character details I put in! He’s just reaching through her as if she wasn’t there. He does that a lot. oooh, you mad! You’re mad at me! I can see it in your face!